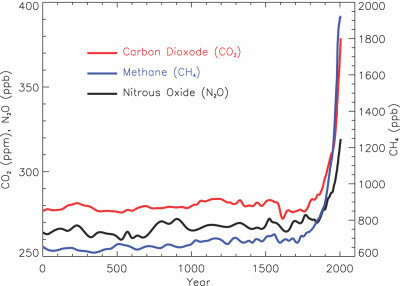 On Earth, the major greenhouse gases are water vapour, carbon dioxide (CO2), methane (CH4), nitrous oxide (N2O) and ozone (03). These gases trap heat within the surface-troposphere system like a warm blanket. This natural phenomenon was called the greenhouse effect. Without it, the mean temperature on Earth would be -18°C ! However, the greenhouse effect strengthens when human activity increases the atmospheric concentrations of some greenhouse gases. Carbon dioxide accounts for 75% of the "increased" greenhouse effect caused by non-natural sources. The burning of fossil fuels has increased the CO2 levels by more than 30% compared to pre-industrial times. It is estimated that it would take several hundred years for the CO2 to return to normal levels if all non-natural emissions stopped today. 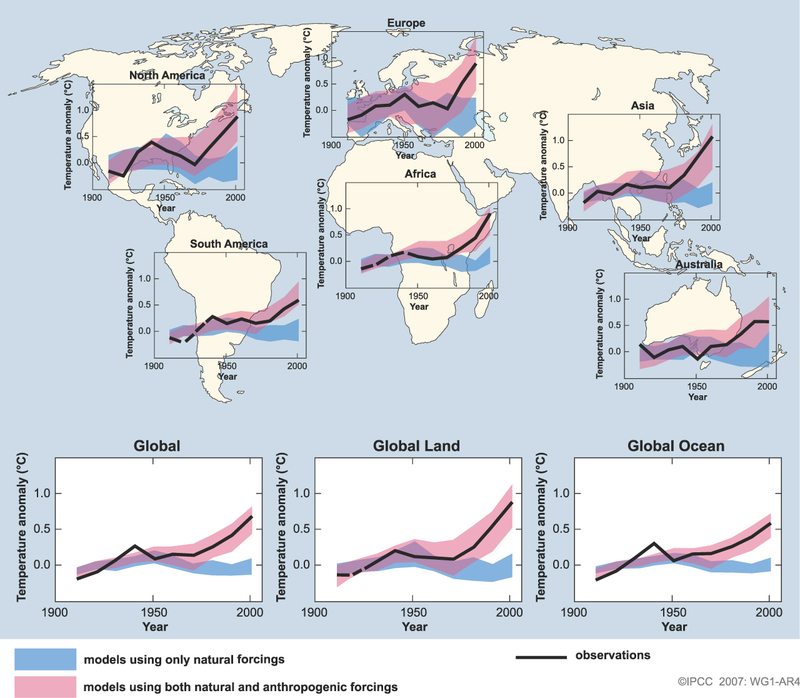 Global warming is the current increase in the average temperature of the Earth's near-surface air and oceans since the mid-twentieth century, and its projected continuation. This confused ice passenger clearly shows how climate change is affecting the Arctic. Photo: © Arne Nævra. 172 national governments have signed and ratified the Kyoto Protocol aimed at reducing greenhouse gas emissions. However the protocol gives no obligation beyond monitoring and reporting emissions. The United States is one of the developed countries that has not ratified the treaty and is one of the significant greenhouse gas emitters. There is an ongoing political and public debate worldwide regarding what action should be taken to reduce or reverse future warming or to adapt to its expected consequences. The IPCC is a group of hundreds of experts from more than 100 countries. They produce reports summarizing what we know about climate change and how it will evolve. The reports of the IPCC are used by government officials as they make policies about how their countries will tackle problems like greenhouse gas emissions, climate change, and other global changes. In October 2007 the IPCC was awarded the Nobel Peace Prize jointly with Former US Vice President Al Gore "for their efforts to build up and disseminate greater knowledge about man-made climate change, and to lay the foundations for the measures that are needed to counteract such change" announced Professor Ole Danbolt Mjøs, Chairman of the Norwegian Nobel Committee. 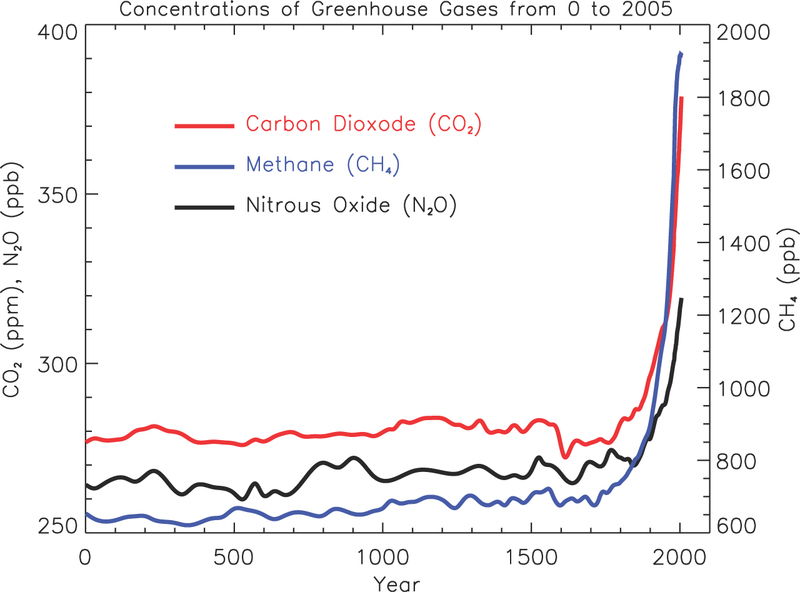 Atmospheric concentrations of important greenhouse gases over the last 2,000 years. Increases since about 1750 are attributed to human activities in the industrial era. Source: IPCC 2007. Increasing global temperature will cause sea level to rise, and is expected to increase the intensity of extreme weather events and to change the amount and pattern of precipitation. Other effects of global warming include changes in agricultural yields, trade routes, glacier retreat, Artic and Antartic ice melting, species extinctions and increases in the ranges of disease vectors. Comparison of observed continental- and global-scale changes in surface temperature with results simulated by climate models using either natural or both natural and anthropogenic forcings. Source: IPCC 2007. Interested by climate change ? Check out these links ! By the way, do you know what's the difference between weather and climate ? Greenhouses gases trap heat in Earth's atmosphere, within the surface-troposphere system. is the current increase in the average temperature of the Earth's near-surface air and oceans since the mid-twentieth century, and its projected continuation. These terms sum up global warming and its consequences. 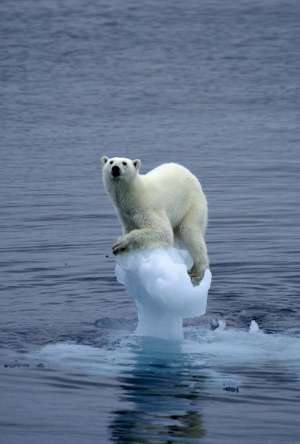 The term climate implies that rising temperatures are not the only effect of global warming. The term global strenghtens that it involves the entire Earth.